Heading into the 1950s, Roanoke did not yet have its own television station. With a good antenna, the few who owned TV sets could watch the programming of WFMY-TV from Greensboro, WSAZ from Huntington or WTVR from Richmond. The Roanoke Times printed their daily schedules for those who who were able to watch. But for most folks in the Star City, the media consisted of the newspaper, magazines, movies and radio. By 1950 all three radio stations were signing on each day at 6:00 AM. WDBJ and WSLS signed off at midnight and WROV was on an additional hour, until 1:00 AM. Radio sounded like an audio version of what television was to become: a diverse selection of music, news, and entertainment programs that typically were thirty or sixty minutes long and changed on the hour. About half were from the network and the rest were done live from the studio or nearby theaters and auditoriums. Most local shows followed a basic script but were ad-libbed and often, the announcers "flew by the seats of their pants." 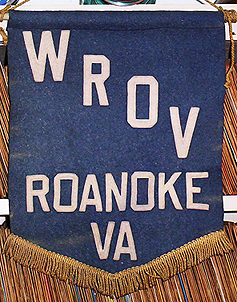 This 1950s WROV remote banner now hangs in the library of your favorite uncle. Lee Garrett recalls those days at WROV: "We did everything. We had a format that you wouldn't believe. One hour I might be doing the morning sign on, a thing they called the Yawn Patrol. Then somebody else would come in and pull a couple of records and do something else then next thing I might be doing a country music show, I may be doing a symphony two hours later. You know, we just ran the scale. We had a lot of fun back then, but you know radio back then was a lot of fun because you had an opportunity to get on the air and improvise and do all sorts of things and not tick the managers off that much." WROV's studios in the Mountain Trust Bank building were built with this sort of programming in mind. No expense was spared in making the facility as fine as those of America's larger stations in terms of acoustical quality, efficiency and comfort. A place where visiting celebrities would feel at home. According to the December 1946 newspaper ad, one entered the studios "through a doorway placed in glass block paneling that opens into a central lobby done in Honduras mahogany with asphalt tile flooring and a special acoustical ceiling." The lobby was furnished in ultra-modern red leather furniture. From there, one could view the entire station operation through glass panels. At the left was the news department with the teletypes arranged so that visitors could read the incoming news and watch the news staff as they prepared material. Next was the standby studio for newscasts, talk shows, and station announcements. Then came the recording studio which was used for the making of 12" and 16" shellac program transcription records. To the right of the recording studio was Studio B, which was used for general broadcasts. In the center one found the master control room. 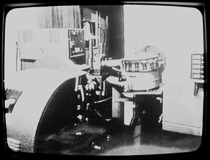 Here the console and other equipment were in full view of those in the lobby and they could watch as the engineers operated the control panel. Next was Studio A, the largest of all the studios, which was used for broadcasts in which large groups, such as the Wanderers of the Wasteland, took part. Just beyond that was an audition room where one could listen to a performance in complete comfort. Farther back through a long corridor one found the offices. 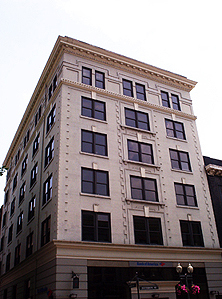 The entire top floor of the building which housed the studios and offices was air conditioned—somewhat of a rarity for Roanoke at the time. The studio walls featured wainscoting that was painted cascade green and the upper parts were finished in copper, which gave an unusual and pleasing color scheme and went well with the paneling in the main lobby. 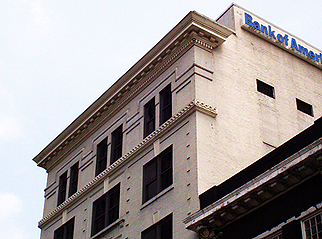 The former Mountain Trust Bank building, today, is home of the Bank Of America. Because of noise from streetcars going up and down Jefferson Street, the WROV studios were designed to "float." Cables were strung across the building on which the studios were built. This was to reduce noise and vibrations emanating from the streetcars, below. Because of this, the studios were higher than the rest of the station. Announcers and operators in the studios were able to look out the windows, down into the lobby and other parts of the station. And this arrangement made it easy for pranks to be played. One of the biggest pranksters was Coleman Austin, another WROV personality of the era. Lee recalls "Coleman would do crazy things. You'd have to almost see WROV's studio, main studio back at that time. You walked in the reception room and we were way up high and there was glass all the way across and you're sitting behind the console and looking down and you can see anybody coming into the door and what have you. Well, Coleman would get in there while you're on the air, for Pete's sakes, and he'd take off all of his clothes except for a necktie. And he would walk by this thing, just slowly going by with nothing but a tie on. Another shot of the former MTB building showing the top floor, once the home of WROV, WROV-TV and later WDBJ-TV. "I picked it up and I read the first page and pulled it off and the rest of the copy must have had 500 staples in it. It was stapled all together. He let me sit there and sweat for about 30 seconds then he finally brought me some more copy. He did some crazy stuff. The Wanderers of the Wasteland were a local act who did a live show on WROV during the station's early days. "And they'd leave it open and I'd come on there and say 'This is Coleman Austin & Lee Garrett… welcome to the show' and about the time I'd get my mouth open, he slapped a piece of tape on it. And I'm sitting there saying “Well folks, mmpph humph mmpph!” And I'd be sitting there reading a commercial and he comes up with a cigarette lighter and sets it on fire. He was crazy!" Jim Shell worked for WROV before moving to Channel 10. Another of Lee's friends at the radio station and later WSLS-TV was Jim Shell. After serving in the Army during World War II, Jim returned to Roanoke and went to work at WROV. The station was playing much classical music at the time and, according to Jim's son James, Jim was hired partly because he could properly pronounce the names of the classical composers. Following the death of PD Gordon Phillips in a New York City car accident in 1947, Lee and Jim began programming the station and did so for the next six years. 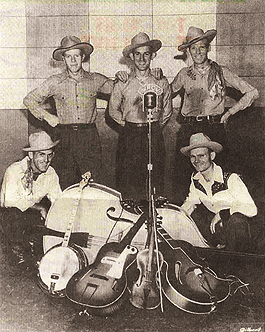 The two briefly hosted a live stage show called The Blue Ridge Jamboree that featured acts such as Grandpa Jones and the Carver Sisters. Jim followed Lee to WSLS-TV in 1954. 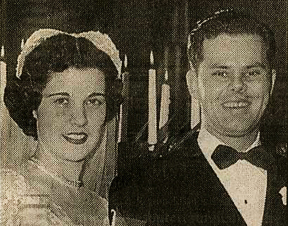 Lee Garrett married Charlotte, left WROV and joined Channel 10 in 1953. Lee recalls "we used to have a lot of fun. Tech would have a band coming in on a Friday night, one of the major bands, you know, the Dorsey's for example, they'd play over at Tech and since they were in the area, we would get them into town, take them over to the old Legion Auditorium and put ‘em on the air. I think the only major orchestra that we didn't do was Sammy Kaye because he was on NBC. "A lot of times we'd feed ‘em to the network. And Coleman and I did that and I never will forget the last one. I went on the air at 11:45 on New Year's Eve and we broke at 12:00 and did a system break then came back on at 12:15. And when I introduced the program I said 'Station to station across the nation, Mutual brings you the music of...Cootie Williams.'" 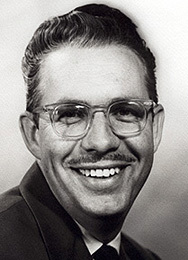 In 1954, WROV hired a man who would be with them for the next ten years and a Roanoke radio star for the next twenty-nine. Jerry Joynes, who had worked in Baltimore, Hampton and most recently at WNOR, Norfolk, was one of the last people hired by Roanoke Radio, Incorporated. He learned of the job opening from a mutual friend: "Don Stanley was a salesperson at WNOR then WROV and later WFIR, I think. He ended up forming his own agency. Anyway, he went to Roanoke and mentioned me, they asked me if I wanted to come up. I had a friend who was going to school in Staunton and I went to see him and decided to swing by Roanoke and talk to the manager. This was in 1954 and led to my job at WROV." 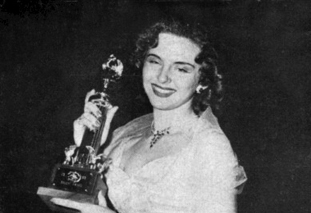 Anne Ceglis, Miss Virginia and Miss America 1st Runner-Up, 1953, helped Jerry broadcast the 1954 Miss Virginia Pageant. "Well, it so happened that the runner-up Miss America the previous year, Anne Lee Ceglis, was from Norfolk and I knew her. And she spotted me when I came in and when I saw her I said 'Hold it! You've got to help me out here. I have no idea...' and she did. She sat with me the whole evening and that got me through it. She was there as a representative of Miss America. I was sitting over in one corner with my little microphone and we were just talking away. Fortunately, I would say a contestants's dress was green and she'd say 'No, AQUA!'" Hayden Huddleston, shown here during his WDBJ years. Another person heard on WROV in the late 1940s and early 1950s was Hayden Huddleston. 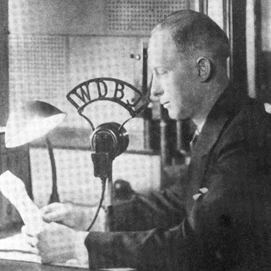 Hayden helped put Roanoke's first radio station ( 3B1Y , which became WDBJ) on the air while working as a high school student for the Richardson-Wayland Electric company in 1924. He remained with WDBJ for years, then produced radio shows and in the 1950s, started his own agency. For a brief while he was a salesman for WROV. One of his shows, Breakfast At The Ponce, was broadcast live on WROV from the Hotel Roanoke's Ponce De Leon restaurant and featured Hayden interviewing local diners. Hayden was an original. Listeners generally either loved his old-fashioned style or couldn't stand his corniness. Jerry Joynes recalls "Hayden had this radio show and I thought it was the worst thing on the air. And it probably was. Because he wasn't really a personality and he only played about two records the entire half hour." In 1951 WROV aired another show called "Kommunity Kwiz" which we also suspect was produced by and featured Hayden Huddleston. The show followed the same "K" naming scheme as "Klub Kwiz" and "Klassroom Kwiz" which were Hayden's locally produced television quiz shows that were popular during the 1960s. Coleman Austin (left) was an original WROV announcer. He was also seen on the short-lived WROV-TV 27 doing shows such as Teen Talk. 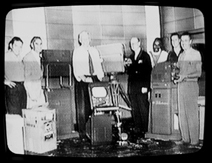 During the early 1950s, Roanokers joined the TV revolution. In allocating channels for the area, the FCC approved 7, 10, and 27 for Roanoke and 13 for Lynchburg. According to the WDBJ-TV web site, various interests began competing for the channels around 1950. Times World Corporation, which operated WDBJ AM/FM, applied for Channel 7, as did the Polan Brothers of Huntington. Shenandoah Life Insurance Company, owner of WSLS AM/FM, applied for Channel 10. Roanoke Radio, the owners of WROV, applied for and got Channel 27. Lynchburg Broadcasting applied for and got Channel 13. 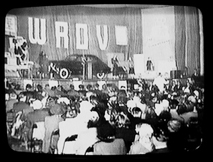 WSLS-TV went on the air on December 11, 1952, and was joined a few days later by WROV-TV, Channel 27. 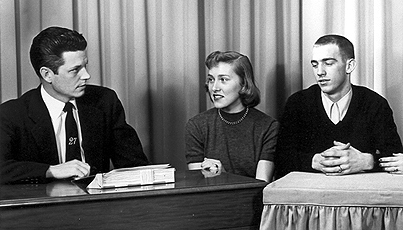 WLVA signed on in Lynchburg two months later on February 8, 1953. To accommodate the new television station, one of the WROV radio studios at the Mountain Trust Bank building was converted to a television studio. Lights and a cyclorama were hung and a few set pieces including a piano were brought in. A tower and antenna were built atop Mill Mountain. But a few months later the station went "belly up." Why? One reason is that there weren't that many people in Roanoke who had television sets back then, and to make matters worse, early model TVs weren't able to receive UHF channels without the addition of special equipment. Tommy Holcomb recalls being a kid and having a little converter called a "pilot tuner" mounted on his family's old Philco set so that it could pick up Channel 27. But most people didn't know about such things and most who did weren't willing to spend the extra money to purchase one. Scenes from the brief life of WROV-TV: A contest (Lee thinks this was at the old American Theater); some of the staff (the two guys in the middle are Frank Koehler and Hayden Huddleston). This wasn't the station's only problem. The studio wasn't lighted well, they only had one camera, and the station had trouble getting programs and sponsors. Radio announcers such as Lee Garrett and Coleman Austin alternated between their radio duties and doing shows on the TV station. According to Lee, "we couldn't get the sponsors because we didn't have the programs and we couldn't get the programs because we didn't have the sponsors. A Catch 22. And we were the first and as far as I know the only station in the country who has ever voluntarily surrendered its permit to the FCC. We gave it up." So, after operating only a few months, WROV-TV became the first UHF station in the country to go dark in 1953. Then the owners began an effort to acquire the other VHF frequency assigned to Roanoke, Channel 7. According to WDBJ-TV site, "Times World and Radio Roanoke continued competition for the Channel 7 allocation. Times World president J. P. Fishburn led a team of WDBJ and newspaper managers who spent countless weeks and months in Washington in pursuit of the authority to build the new station. 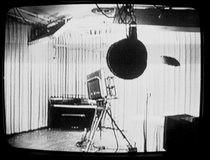 The WROV-TV Studio showing the station's one camera; some of the equipment that was eventually sold to WDBJ-TV. Tragedy struck when Mr. Fishburn suffered a stroke in the course of an FCC hearing and subsequently died. Hearings were recessed for a time, and when they resumed TW and WROV reached an agreement: WROV would drop its application if it recovered its expenses and if TW bought the facilities which had been used for failed Channel 27." Lee Garrett remembers it this way: "Frank Koehler started working toward trying to get Channel 7. And we worked hard at that. And I think we could have gotten it. What happened, I do not know, but somewhere in the middle of this process Frank decided to bail out and left the thing wide open for WDBJ to take it. And they did. And next thing you know, Frank Koehler is working for WDBJ. Now I don't know if there was anything clandestine about that, but it sure does sound suspicious, doesn't it?" 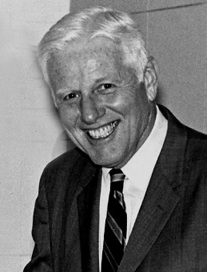 Frank E. Koehler was WROV GM from 1946 to 1955 then managed WDBJ. He previously managed WSLS radio. The advent of television in the early 1950s meant a declining audience for radio stations who were losing their stars to the exciting world of television. Devoid of their personalities, they were now carrying mostly block network programs. Most believed they'd be forever lost in TV's wake. This was happening nationwide, as well as in Roanoke where WROV's failure to acquire a viable television station led to Jim Shell and Lee Garrett leaving for WSLS-TV. This worried the stockholders of Roanoke Radio, Inc. When it was clear that they would not be going into the television business they appear to have made the decision to get out of broadcasting altogether. Though Times World had agreed to buy the equipment used by WROV-TV, they already owned an AM and an FM station and did not want two more—and even if they had, this would not have been permitted by the FCC. So as part of the deal, it was agreed that WROV-AM and WROV-FM would be sold to a third party. This phenomenon was occurring all across the country in the early 1950s. Radio stations without accompanying television stations were seen as being bad investments and were selling for "bargain basement" prices. But every cloud has a silver lining, and this meant that it was now an excellent time for young entrepreneurs who were financially able to buy their own stations to go into business. And in 1955, one of them came to Roanoke, bought WROV and turned it into a radio "powerhouse" that people of the era would never have believed possible.